Of course, this doesn’t happen ostentatiously, but rather integrated into the background story of a product, such as the bottle I have in front of me today. 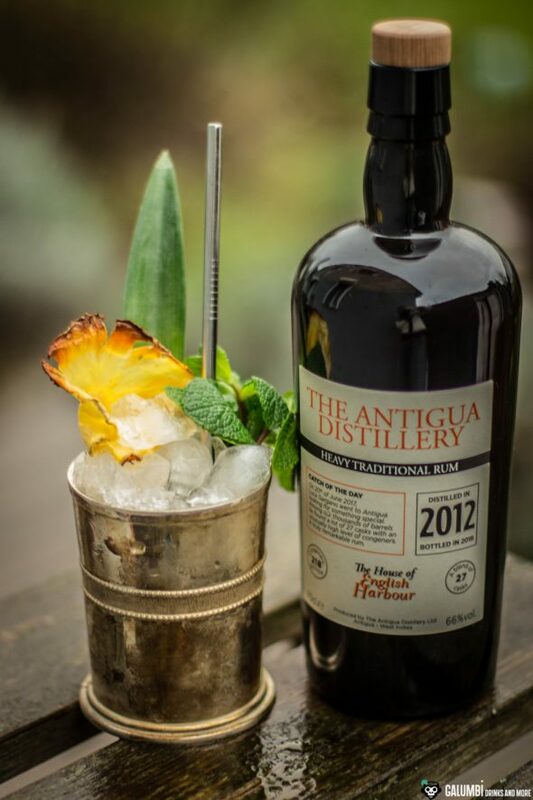 The Antigua Distillery – Heavy Traditional Rum, that’s the name of the bottling, comes in a rather simple but quite elegant and informative garment as we know it from Velier. Directly on the bottle’s label and the packaging it tells the story of its origin in a short form. This is how we learn that Mr Gargano flew to Antigua exactly on the 20th June 2017 to look for special rum barrels. 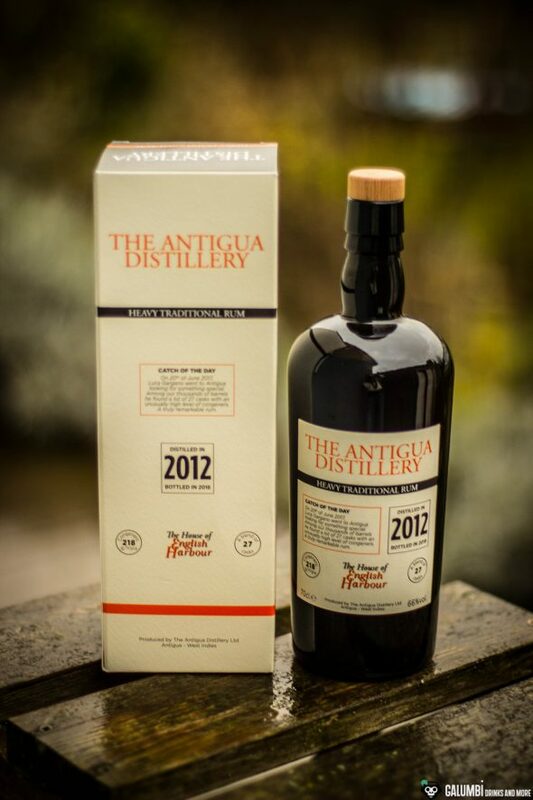 He found what he was looking for in the Antigua Distillery – 27 barrels to be precise that really delighted him. The reason for this enthusiasm – according to the label – was the extraordinarily high proportion of congeners (sometimes also referred to as fusel oils), which also include esters (the chemical compounds so highly appreciated by rum connoisseurs). Here, too, the label informs us directly about the fusel oil content, which is indicated at 218 g/hlpa. From those 27 barrels, Luca Gargano created a blend and filled it directly into the bottles with a proud ABV of 66%. High amount of congeners, high alcohol content: the name “Heavy Rum” has some merit to it. 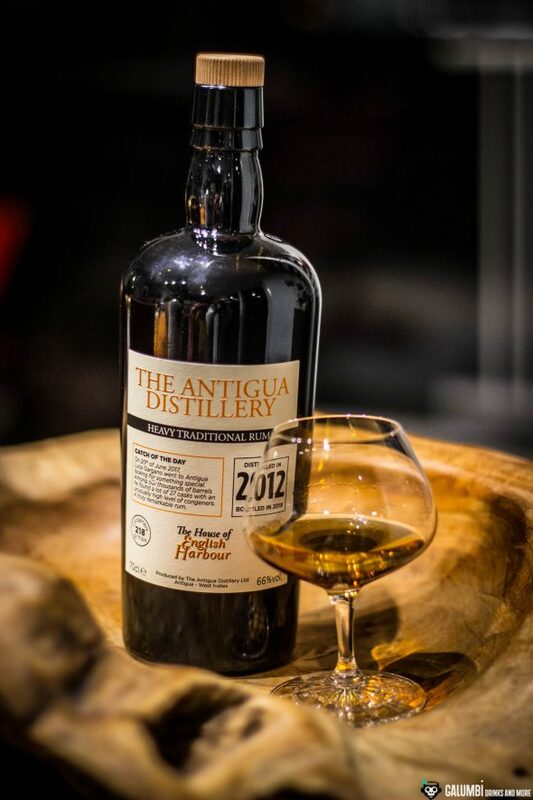 The Antigua Distillery is the distillery behind the rum brand English Harbour and is usually not known for single cask bottlings. It distills on a Savalle column distillation plant from 1932 and the rum is usually allowed to mature in former bourbon barrels made of American white oak. 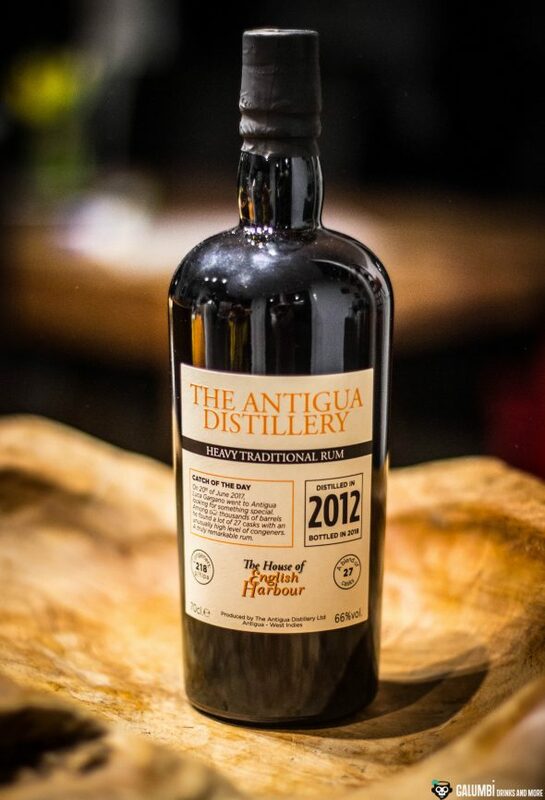 The same happened to the Heavy Traditional Rum, which was distilled in 2012 and then bottled in 2018. 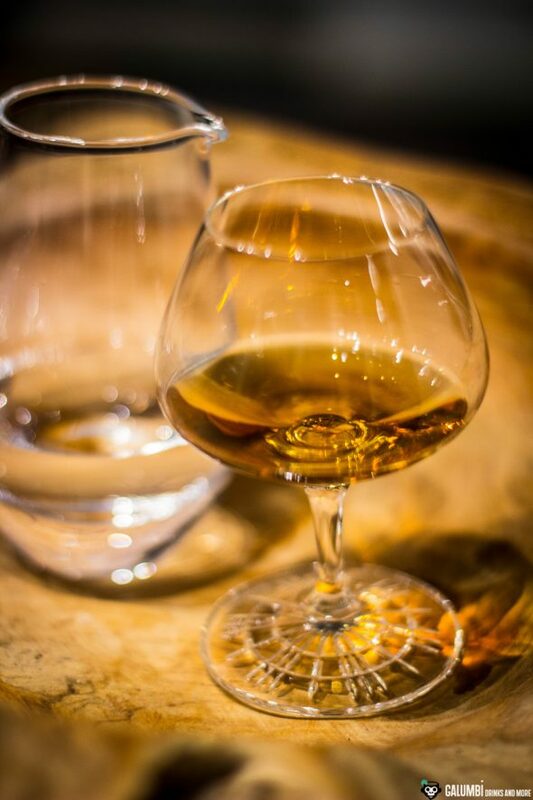 The age of the blend can therefore be estimated at five to six years. The price for the bottle is about 60 Euros. In short: on paper, The Antigua Distillery – Heavy Traditional Rum really sounds very, very promising and I am curious to see what will await me in the tasting. Due to the high alcohol content, I have also diluted it a bit with a few drops of water to a drinking strength of approx. 50% vol. – accordingly I have also included the differences caused by dilution below. Water is essential for this rum! Aroma: A whole potpourri of exotic fruits (banana, pineapple, ripe peach), but also dried fruits (raisins, perhaps some plum) can be found here immediately with immense intensity. Powerful and heavy, this rum lives up to its name right from the start. Behind those fruits, a whole truckload of spices like cinnamon, nutmeg, pepper and pimento arises, but also nuances of rosemary. In addition, there are fine vanilla and caramel as the expected bourbon barrel reminiscences. There’s a lot in here, I really like it! with a few drops of water: the concentrated load of fruit recedes somewhat, but remains the decisive first impression. On the nose, greenish and woody notes appear, but above all vanilla and caramel come to the fore. In addition, I now feel more reminiscent of ripe pears. Taste: at first the 66% vol. start surprisingly restrained and bring with them a lot of fruit (especially bananas), in addition to clearly recognizable oak influence, vanilla, and spices. After a short time, however, the alcohol becomes too powerful for me, the rum brings interesting adhesive and fermentation notes with it (I know, that always sounds funny), but I find the tingling on the tongue too unpleasant and therefore grab my small carafe with water. with a few drops of water: a brown Muscovado sugar offers a very harmoniously and well-balanced first impression, the fruit notes follow on foot (also here a ripe pear finds its way into the otherwise exotic fruit basket) alongside some caramel. The vanilla retreats into the background, but gets an almost creamy note like in a crème brûlée. The alcohol doesn’t bother any more. A very good rum! Finish: very long with fermented fruits and spices, but pleasantly dry. Grilled Pineapple Syrup: simply bring sugar and water in a ratio of 2:1 to the boil and let simmer on a medium heat until the sugar has dissolved – allow to thicken a little. Pour the (still hot) syrup into an airtight container. Finally (in the same proportion to the sugar) add pieces of freshly grilled pineapple to the syrup and leave to rest for at least 24 hours. Then filter out the pineapple pieces. 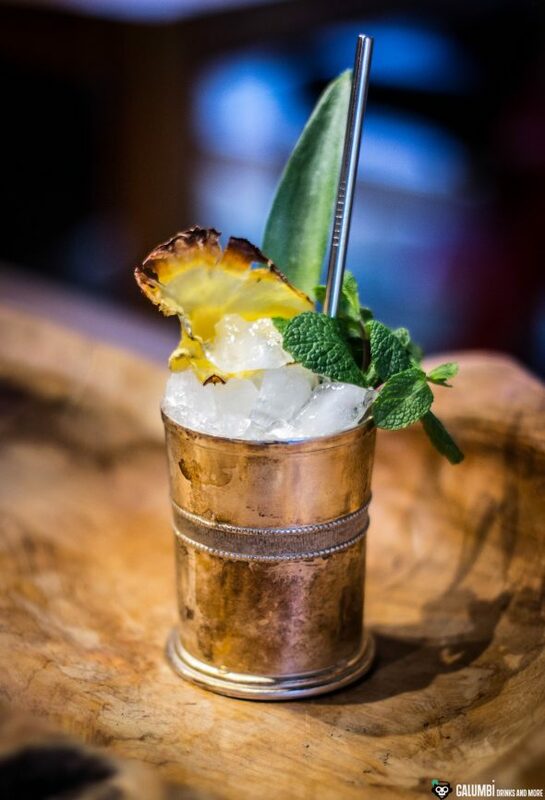 Preparation: Put the mint leaves, rum and syrup in a silver cup and leave to steep for about 5 minutes. 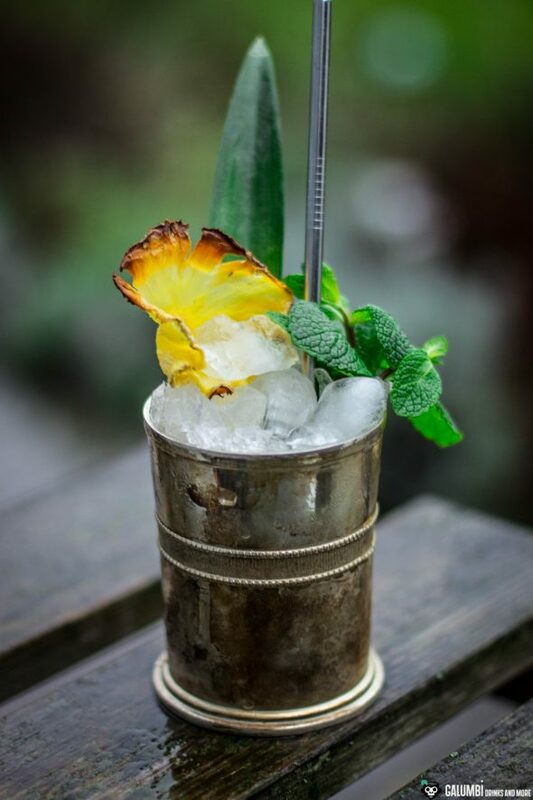 Occasionally press the mint leaves along the inner surface of the mug with your muddler. Finally add water and fill up with crushed ice. Stir and again add crushed ice, then garnish.